Chiffon and georgette are similar lightweight sheer fabric, available in both silk and polyester. Chiffon is 'floatier' and often slightly lighter and more transparent. Georgette, named after Parisian designer Georgette de la Plante, is drapier and often a little heavier. Both have a matt crepe texture, so no sheen. They are popular dress fabrics, especially for summer wedding dresses, both for the bride and for bridesmaids, elegant evening wear, and blouses. 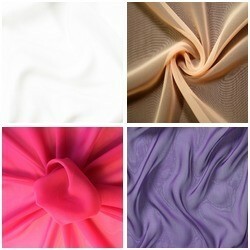 Chiffon is also used for scarves, and in lingerie, georgette for the lightest-weight trousers and suits. Two-tone or 'shot' colours have warp threads in one colour, and weft threads in another.